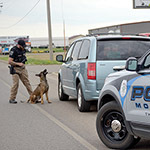 Mobridge Police Department drug detection dog, Zane, alerts Officer Nate Pepin of the presence of drugs in a training drill for K9 drug detection units from three counties held in Mobridge on Tuesday, June 6. 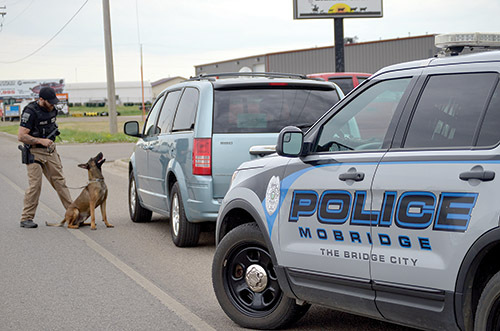 The special units from the MPD, Cheyenne River and from Corson County searched multiple vehicles lent to law enforcement from Beadle Sales in Mobridge. Other local officers posed as drivers who may or may not have illegal substances hidden in the vehicles. The K9 units searched the vehicles during the traffic stops. This type of training and other scenarios are held about once a month in the area as required by state training regulations.